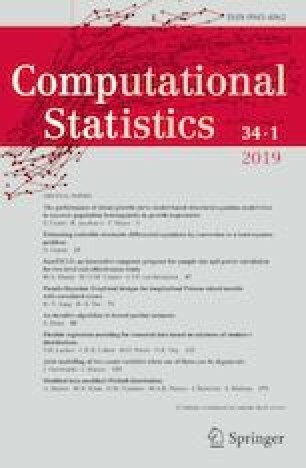 In this work we give new density estimators by averaging classical density estimators such as the histogram, the frequency polygon and the kernel density estimators obtained over different bootstrap samples of the original data. Using existent results, we prove the \(L^2\)-consistency of these new estimators and compare them to several similar approaches by simulations. Based on them, we give also a way to construct non-parametric pointwise variability band for the target density. We would like to thank project ECOS-2014 Aprendizaje Automático para la Modelización y el Análisis de Recursos Naturales, no. U14E02, the LIA-IFUM and the ANII-Uruguay for their financial support. For sake of completeness we present in this appendix the individual values of Fig. 3. In the following tables (Tables 3, 4, 5, 6, 7), values are \(100\times \)MISE obtained as mean average over 100 replicates. At each line, best results are shown in bold.